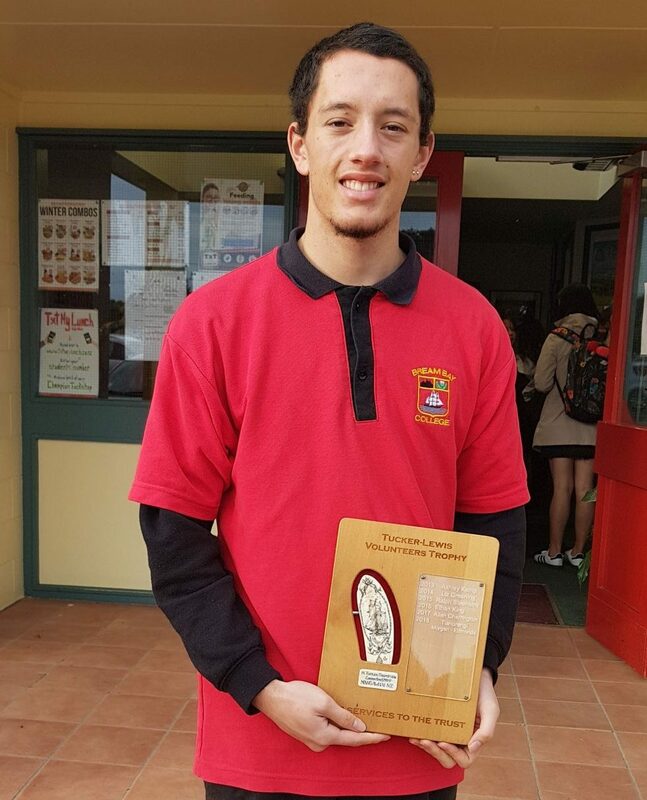 The R. Tucker Thompson has presented this year‘s Tucker Lewis award to Tiahorangi Morgan Edmonds, a 16 year old Bream Bay College student. The Tucker Lewis award is presented by the Trust to individuals who have demonstrated an ongoing commitment to the Trust in terms of volunteering their time in support of the Trust’s operation. The beautiful scrimshaw carving was done by Norm Lewis, a long-time friend of the Trust and is held on board the vessel. Tiahorangi first sailed on board the Tucker as a sail trainee in 2016, at the age of 15 – in fact, he went back for a second voyage and then a third. He then went on to do a voyage on the Spirit of New Zealand in 2018. He then took up the opportunity to volunteer for the R. Tucker Thompson during the course of the 2017-18 summer tourism sailings, supported by his mother, who helped immensely as transport manager. This was not an insignificant effort with the ship being based in Opua and Tiaho lives in Bream Bay (that’s where Mum Tania came in). All volunteers have to attend two training sessions and commit to at least four sailings over the year. He and Tania attended both volunteer training days in November then signed up to volunteer every other fortnight over school holidays, giving up his entire weekend over that period; huge commitment for the teen from Bream Bay College, not to mention Mum Tania. They also supported the Trust’s visit to Whangarei in May this year. This ongoing commitment to the Trust has now been recognised with Tiahorangi being awarded the Tucker Lewis Award for volunteering. In addition, not only did his volunteering get noticed, his quiet but thoughtful attitude on board the ship was observed by the Masters and other crew. When the time came to consider who might be next year’s cadet, Tiaho’s name came up and after discussion with him and the family, he was offered and accepted the 2019 Cadetship. The Cadet role is like an apprenticeship, providing a training pathway into the marine industry by offering the sea time, training, and financial support towards professional qualifications. At the end of the year, the cadet can choose to take a Maritime New Zealand entry level Skipper’s Certificate or the Qualified Deckhand Certificate for international work. This means that they finish up with a qualification and are debt-free. Congratulations Tiaho – and a very big thank you to Mum Tania who has been supporting you in your efforts.